This welcome reissue from the Westminster Cathedral Choir on Hyperion is classic Palestrina. It is as near as you'll get to that 'Catholic' ideal of Palestrina's music as serene and even, with slowly evolving textures and dynamics that articulate the various movement's liturgical functions. The choir, of course, has a reputation for doing this sort of thing and doing it well. This disc is an example of it all adding up. You've got note perfect singing from everybody, even balance (although it is perhaps a little top-heavy at times), and a relationship with the warm acoustic that only comes from years and years of performance at the venue. 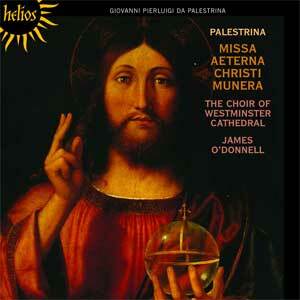 The 'Missa Aeterna Christi munera' well deserves its fame as one of Palestrina's most famous masses. Texturally, it is not his most complex work; it is in four parts throughout apart from the second Agnus Dei where the tenors are divided. It therefore suits this big choir approach well, and neither the number of singers nor the acoustic ever threaten the clarity of the counterpoint. Among recent versions, the Naxos recording with Jeremy Summerly and the Oxford Camerata (8.550573) serves as an interesting comparison. Summerly's musical aims are very similar, and despite his use of a smaller choir of adult singers, the pitch is the same and the tempos correspond closely. His smaller forces mean that he has the edge when it comes to detail, and he insists on harder consonants. He also puts in more localised dynamics. Summerly's mass strikes a different balance between the liturgical and the aesthetic, but demonstrates that you don't necessarily have to iron out the phonetics of the text to achieve transcendence. That's not to say that the Westminster forces present the mass as an unchanging monolithic unit. There is a surprising amount of intimacy here too. In the Benedictus, for example, the choir is reduced to chamber proportions. The accuracy of the singing is such that even here the voices blend, and enough of the monumentality is maintained to allow the section to cohere with the mass as a whole. Three motets follow, Sicut cervus desiderat, Super flumina Babylonis and Vidi turbam magnam. These make for ideal programming for the Westminster choir, as each is an almost perfect example of Palestrina's art. The arc form of each work gradually evolves, with the counterpoint becoming more and more involved. They provide a great opportunity for the choir to demonstrate the discipline and vocal control that makes their Palestrina special. I wonder if there are any more motets like this in Palestrina's output, because if the choir could fill a disc with them they would be on to a winner. The last time I heard Canticum Canticorum Salomonis was on another Hyperion reissue, by Pro Cantione Antiqua under Bruno Turner (CDH55095), but the results could not be more different. The ten singers of Pro Cantione Antiqua transpose the music down a third and sing at least 30% faster than here. Unsurprisingly, the results are difficult to even identify as the same music. The Westminster Choir sing beautifully here, but I miss the variety and nimbleness of Turner's forces. The concluding Magnificat primi toni a 8 sets the boys' voices against those of the men in various contrapuntal combinations, demonstrating that the younger singers are more than a match for their senior colleagues. If I've one reservation about this reissue it is the unfavourable comparison it draws with more recent recordings by the choir on the same label. The young voices here really are on top form, but I can't say the same about the more recent recording they made of Palestrina masses in 2009 (CDA67785). On that, the intonation and balance from the boys is a regular problem. Still, this revising of the work of the previous generation serves to demonstrate just how it is done. And besides, there is no way that any choir can maintain results at this phenomenal level indefinitely.